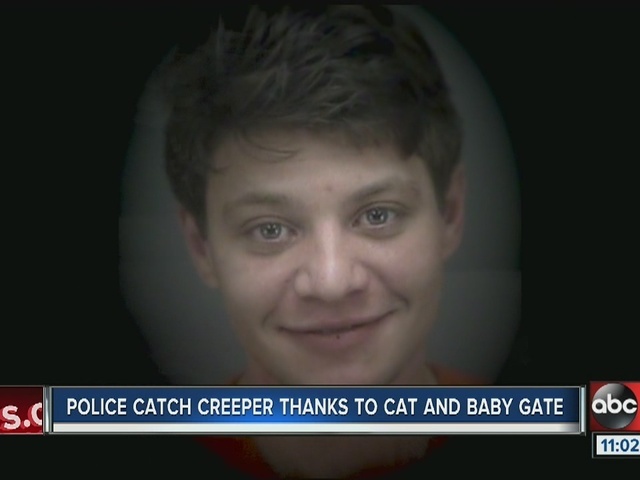 A St. Petersburg, Florida mother said she is grateful she wasn’t harmed when a man broke into her home on November 20 around 3:30 a.m. and began petting her cat. Brittney Cline said she was in a dead sleep when her cat jumped off the bed and woke her up. Cline grabbed her phone and turned on the light to see a man crouched at the foot of her bed petting her cat. From there Cline said he disappeared into the night. Little did she know the man who St. Petersburg Police arrested on Wednesday morning was her neighbor. Jasper Fiorenza was charged with burglary. Cline said detectives were able to pull a fingerprint off her bedroom door. The 24-year-old Fiorenza was arrested for simple battery and grand theft in 2014 so his fingerprints were in the police database. Fiorenza lives with his father a street over from Cline’s home. Cline says on Wednesday, undercover detectives tracked Fiorenza from his dad’s home trying to break into other homes in the neighborhood, including hers. And Cline says he was doing it at the same time he broke into her home less than two weeks earlier. “The fact that he actually had the audacity to try and come back is mind boggling to me,” Cline said. Cline made sure all of her doors were locked and she installed a new home security system. Cline is grateful she wasn’t hurt.